All kits include jump rings and illustrated instructions for the chosen item. The instructions includes details on all materials and tools needed. There are many illustrations to show you the different steps in the particular weave. Pattern variations may be possible in some of the weaves. If that interests you, email me to let me know what you are looking for and I will see what I can do. Any findings (including clasps), crystals, beads etc. are supplied by you unless indicated in the kit description otherwise. 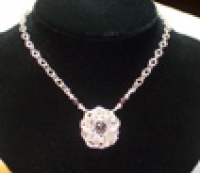 I have included a few clasps and earring findings for purchase on the website. Please add them to your order if you would like one. We also have some tools available purchase. My book contains a great deal of general information about chain maille and also includes thirty-five projects with instructions. If you have the book with the instructions for a project, be sure and order a refill kit (no instructions included) and the cost is less. 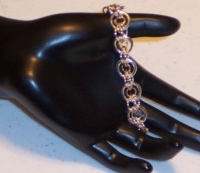 All bracelet kits are for 8 ½ - 9 inch lengths and all necklaces are for 18 inch lengths unless stated otherwise. If you wish a different length, please email the request. If desiring to substitute another metal type such as Argentium in a weave, email me for a price quote.